The Healthcare and Social Assistance industry is the largest employing industry in Australia, rapidly expanding and projected to continue to do so as the population both grows and ages. However it has a large number of work-related injuries and illness reported each year. 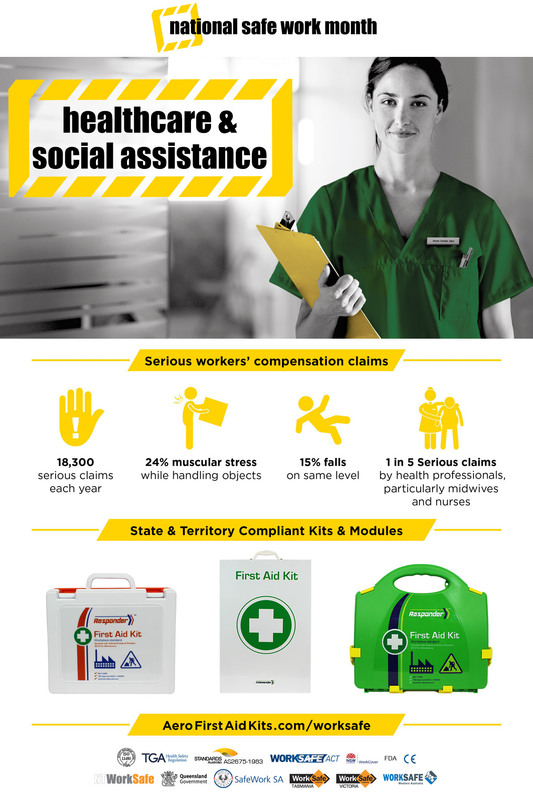 Statistics gathered by the Australian Government statutory body Safe Work Australia between 2011-2012 and 2015-2016 show that the Healthcare and Social Assistance Industry has on average 18,300 serious workers compensation claims each year, with 20% of those by Health Professionals, particularly midwives and nurses. 24% of physical injuries reported were for Muscular Stress while handling objects and 15% from same-level falls. Actual numbers of injuries are unknown, as only the most serious of injuries are reported. Manage your workplace safety – check your health and safety obligations with the appropriate State & Territory body safeworkaustralia.gov.au/whs-authorities-contact-information. Higher risk area workplace injuries can be treated effectively with the quality selection of components in this kits. Each kit serves up to 50 people. Respond promptly to incidents with a variety of outer cases to suit all types of environments and any workplace emergency. Each kit serves up to 25 people. For full kit contents and full State and Territory compliance see individual product details. All kit contents are refilled with our Instant Restock™ system: you can refill and service your kits quickly with refill pouches designed to fit into each case type. They provide quick access to all product through a unique centre slit pocket without the need of unpacking each individual product. Available in a wide range of case options, all our cabinets, cases and bags are available with custom labelling. For more information on cases and labelling, see our Case Options. Not rated for workplace compliance, these supplementary kits are useful additions to your compliant First Aid Kit in your work vehicle as a grab-and-go item for specific roadside incidents. This compact kit comes with a warning triangle and safety vest for roadside incidents, with a selection of first aid items needed for treating minor injuries. Rubber sealed for dust protection, this minor eye injury module services up to 10 people. Servicing up to 50 people with one module, this kit is specialised for treating burn injuries. Categories: AU News, News. Tagged:burn injuries | eye injuries | first aid cabinets | rugged first aid kits | softpack fabric first aid kits | tough first aid kits | workplace compliance Bookmark the permalink. 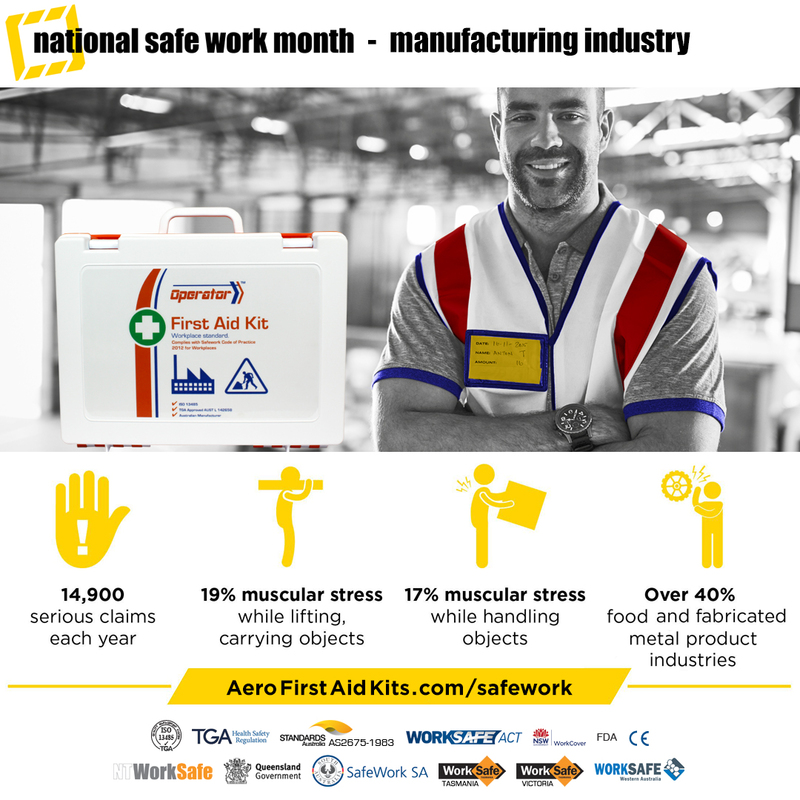 The Manufacturing Industry is a focus for National Safe Work Month this October. 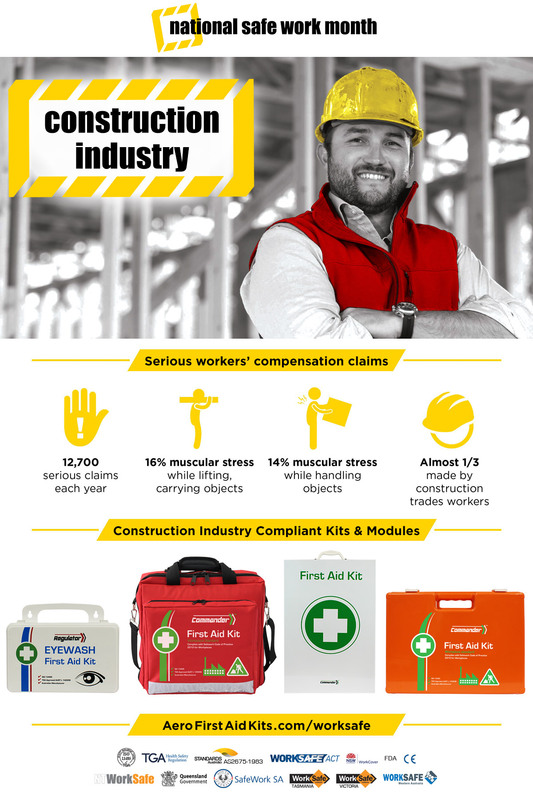 Five years of statistics gathered by the Australian Government statutory body Safe Work Australia between 2011 and 2016 show that Australia’s Manufacturing Industry has on average 14,900 serious workers compensation claims every year, with muscular stress a major problem – 36% of claims were due to lifting, carrying or handling heavy objects. The Food and Fabricated Metal product manufacturing industries together account for over 40% of total serious injury claims. Perfect for the factory floor, with one kit servicing up to 100 workers. Also available for Food Manufacturing Industries with Food Standards Australia Compliance. Designed for manufacturing environments, with one kit servicing up to 50 people. Also available for Food Manufacturing Industries with Food Standards Australia Compliance. Designed for work vehicles, offices, and smaller work sites, with one kit servicing up to 25 people. Also available for Food Manufacturing Industries with Food Standards Australia Compliance. Increase your capability in areas where the risk of burns, spills and eye hazards are high or frequent with these supplementary specialty modules – the rubber sealed plastic cases prevent dust contamination, and as with all our kits they can be custom labelled. These highly portable kits can also be wall mounted. Additional personal kits to be worn by remote-area workers are compliant in all states and territories outside of WA. Categories: AU News, News. Tagged:first aid kit case options | first aid kit refills | rugged first aid kits | tough first aid kits | workplace compliance Bookmark the permalink. 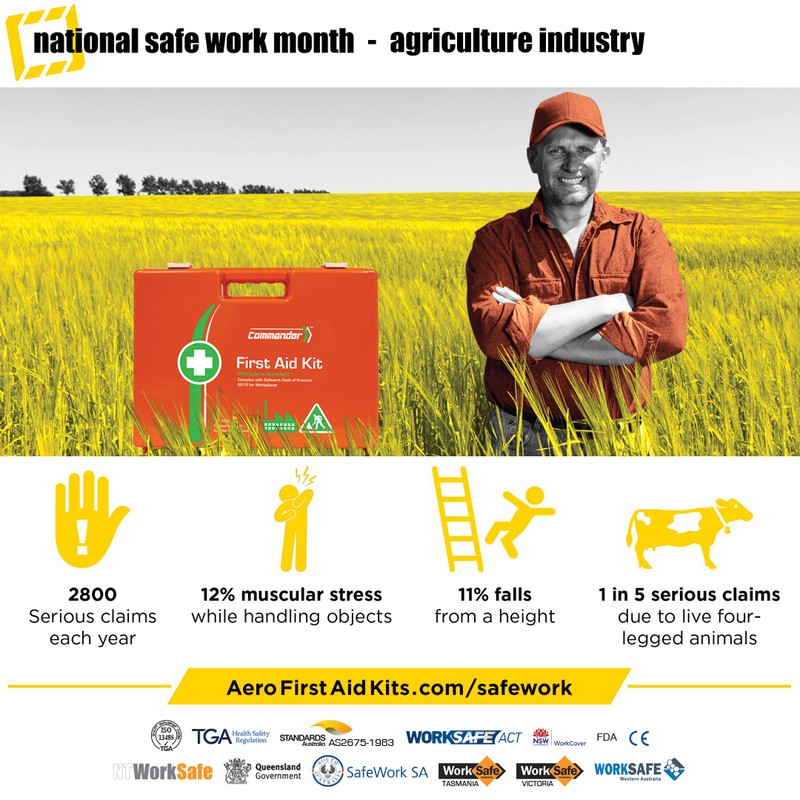 With around 15% of all Australian worker fatalities occurring in agricultural industries, it’s a major focus for October’s National Safe Work Month. 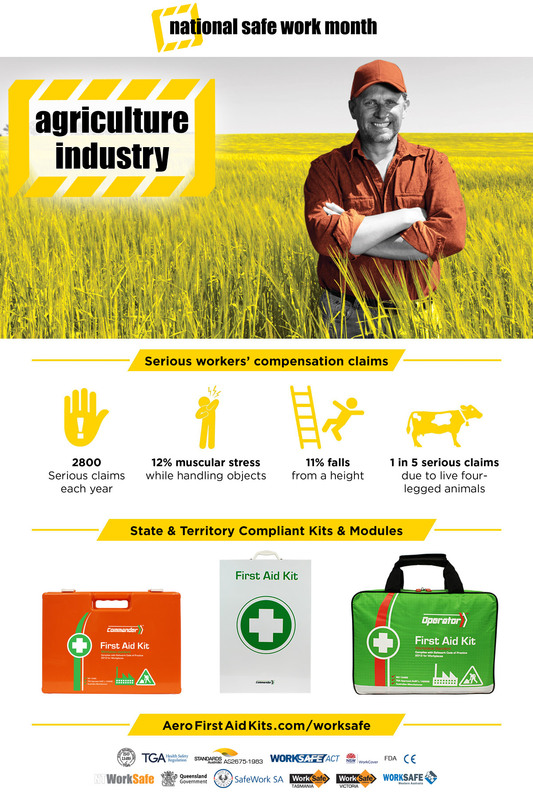 Statistics gathered by the Australian Government statutory body Safe Work Australia during 2011-2012 and 2015-2016 show that in the Agriculture industry there were on average 2,800 serious workers compensation claims each year – 20% were caused by livestock, 12% were muscular injuries sustained from handling objects and 11% of injuries were from falls from a height. The Agriculture Industry often has special requirements in any work situation that involves handling food: high visibility plasters and dressings are among the requirements to ensure that workplace injuries do not lead to foreign objects contaminating food, and burn treatments and eyewash treatments are needed in many areas involving machinery. Our food-grade kits contain our famous blue detectable adhesive plasters and other products to meet the stringent criteria required of the Australian and New Zealand Food and Beverage industries, making them the ideal solution where food handling takes place. Agriculture workers are often in remote areas and prone to Snake Bite incidents – get extra protection with supplementary compact wearable kits designed to deal quickly with these specific demands. Perfect for industrial and worksite environments, with one kit servicing up to 100 workers. Also available for Food Standards Australia Compliance. Designed for site offices, industrial and construction environments, with one kit servicing up to 50 people. Also available for Food Standards Australia Compliance. Designed for work vehicles, offices, and smaller worksite environments, with one kit servicing up to 25 people. Also available for Food Standards Australia Compliance. Vital for outdoor workers, this 1-person kit can be worn on the belt. Containing rescue equipment in addition to a comprehensive First Aid Kit, this kit servicing up to 10 people. Refilling the contents is simple with our Instant Restock™ system: you can refill and service kits quickly with a single order of refill pouches designed to fit into each kit. They provide quick access to all product through a unique centre slit pocket without the need of unpacking each individual product. 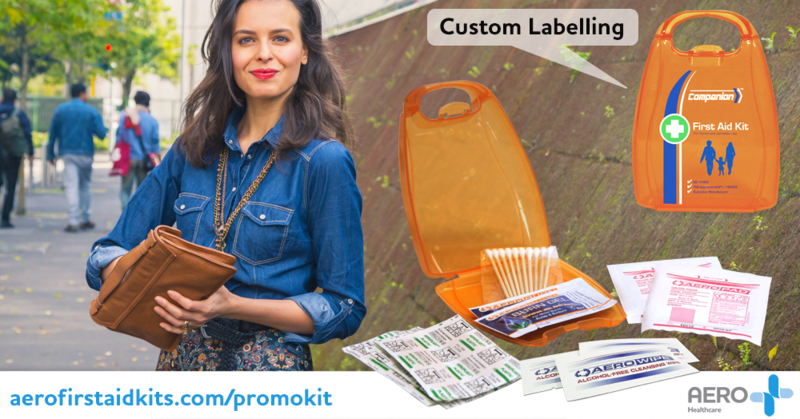 All our kits are available with custom labelling. Increase your capability in areas where the risk of burns, spills and eye hazards are high or frequent with these supplementary specialty modules. The rubber sealed plastic cases prevent dust contamination, and as with all our kits they can be custom labelled. These highly portable kits can also be wall mounted. Categories: AU News, News. Tagged:first aid kit refills | food and beverage industry | outdoor worker first aid kits | tough first aid kits | workplace compliance Bookmark the permalink. October is National Safe Work Month, focusing on reducing injuries and fatalities in Australia’s work places throughout the year. The Road Transport Industry is a national priority under the Australian Work Health and Safety Strategy 2012-2022 due to the high number and rate of fatalities in this industry. 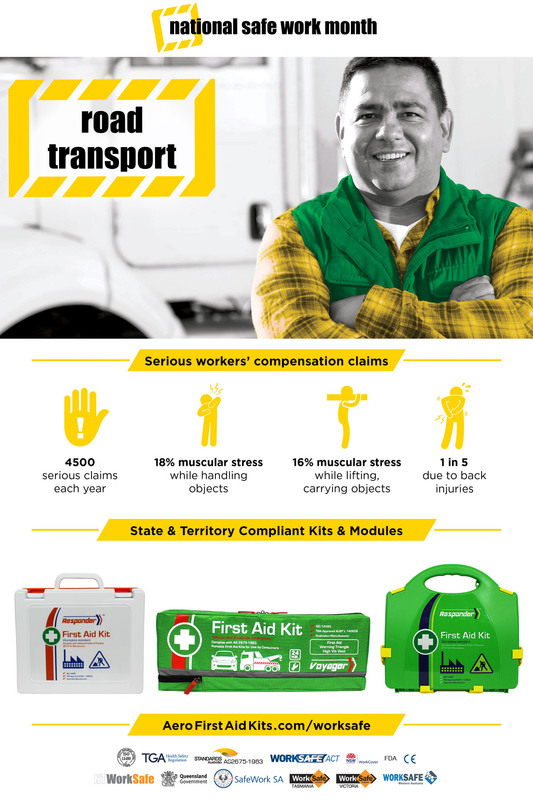 Statistics gathered by the Australian Government statutory body Safe Work Australia between 2011-2012 and 2015-2016 show that the Road Transport Industry has on average 4,500 serious workers compensation claims every year with 20% due to back injuries. 34% of physical injuries reported were for Muscular Stress from lifting, carrying and handling heavy objects. On average a shocking 42 Australian Road Transport Industry workers are killed each year, over 77% are vehicle incidents and over 50% are single-vehicle truck accidents. The Road Transport Industry requires tough and flexible First Aid Kits suitable for vehicle storage. Aero Healthcare has a range of kits aimed especially for vehicles and for road-side use. Our wide range of case types for our fully stocked First Aid Kits comply with workplace requirements across all Australian States and Territories, and all of our First Aid Kits can be custom-labelled with your organisations logo and colour branding. Tough metal case where stored in areas that may come into contact with heavy gear. Flexible softpack – bags that conform to fit in irregular storage spaces while protecting their contents. Rugged Plastic – cases with strong hinges and recessed clasps to cope with the bumps and bashes and rough handling that can occur in busy environments and when quickly responding to a First Aid situation. Weather Resistant – cases built to protect from dust and water, these securely sealed plastic cases are designed to cope with unpredictable weather conditions. Neat Plastic – cases that are smart in appearance and easy to clean, perfect for the front office. Each kit contents serves up to 25 people. Categories: AU News, News. 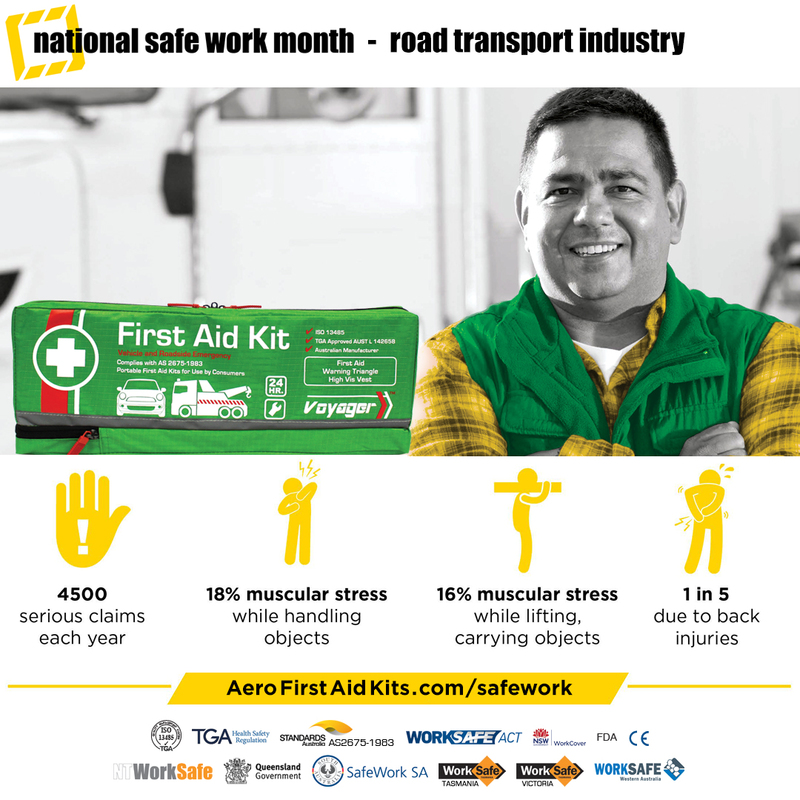 Tagged:outdoor worker first aid kits | vehicle first aid kits | workplace compliance Bookmark the permalink. From emergency services to policy setters, the Public Administration and Safety industry has a wide range of responsibilities – and a wide range of workplace risks. 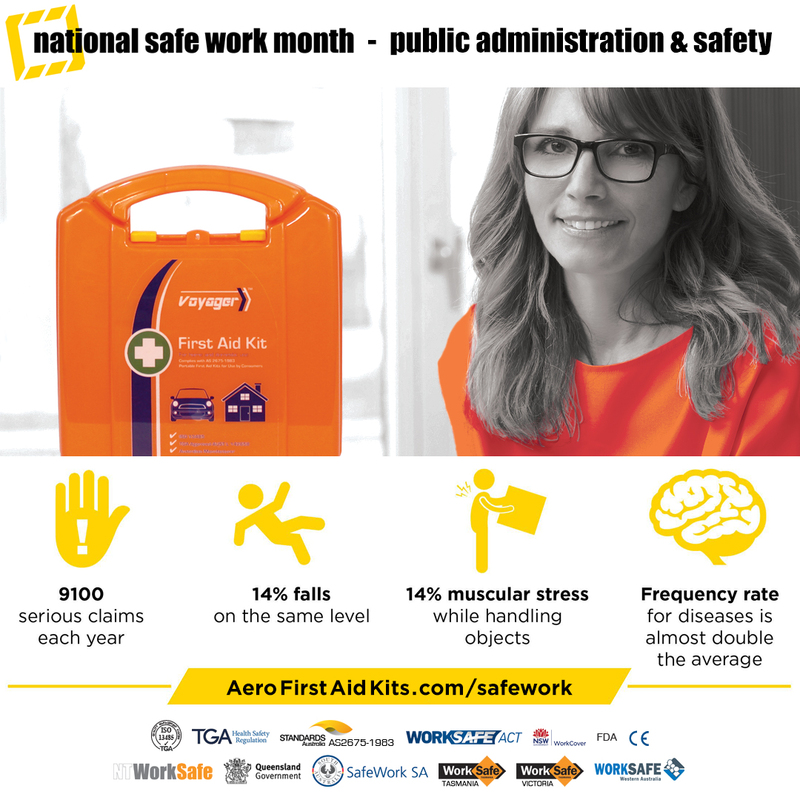 Statistics gathered by the Australian Government statutory body Safe Work Australia between 2011-2012 and 2015-2016 show that the Australian Government’s Public Administration and Safety Industry has on average 9,100 serious workers compensation claims every year with almost double the frequency rate for disease claims across all industries. 14% of physical injuries reported were from falls, with a further 14% for muscular stress while handling objects. The Public Administration and Safety operates in a wide variety of environments, requiring First Aid Kits suitable for offices, vehicles and in any number of demanding environments during stressful situations. 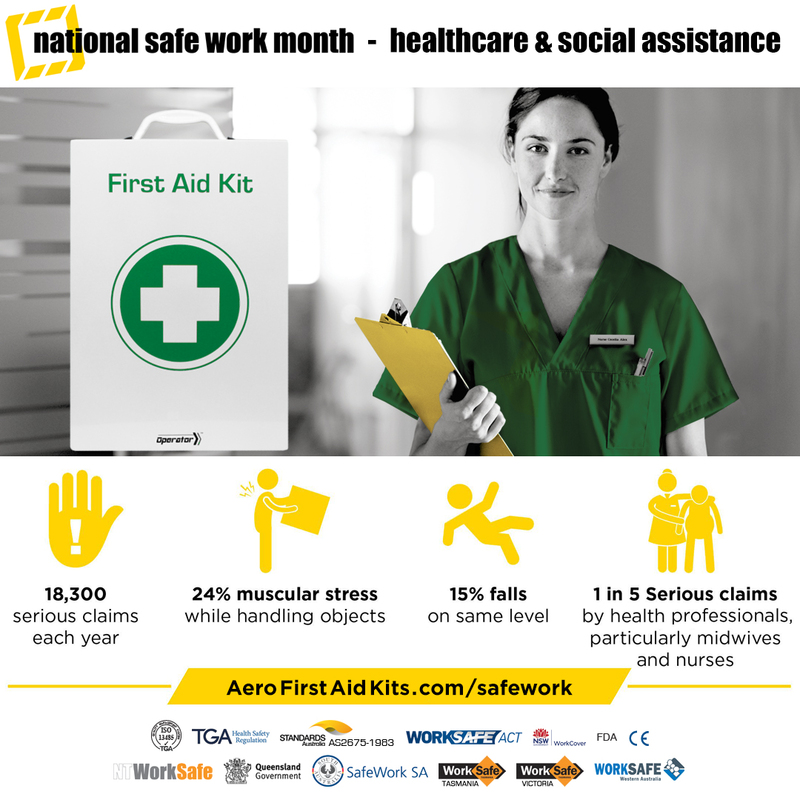 Aero Healthcare has a wide range of case types for our fully stocked First Aid Kits that comply with workplace requirements across all Australian States and Territories. 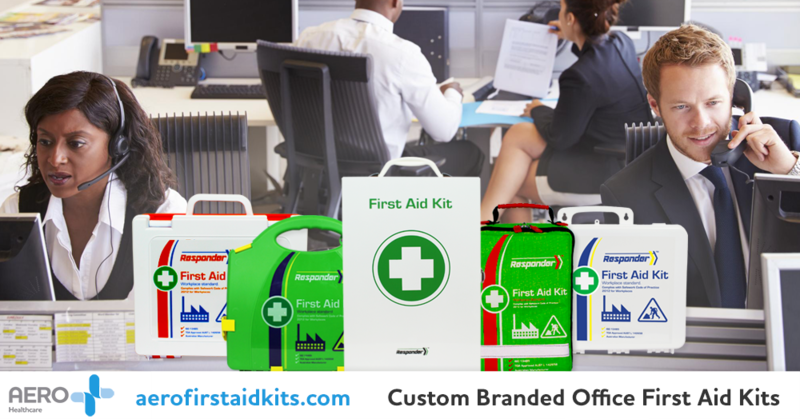 All our First Aid Kits can be custom-labelled with your organisations logo and colour branding. Categories: AU News, News. Tagged:first aid kit case options | first aid kit refills | neat first aid kits | office first aid kits | tough first aid kits | vehicle first aid kits | workplace compliance Bookmark the permalink. 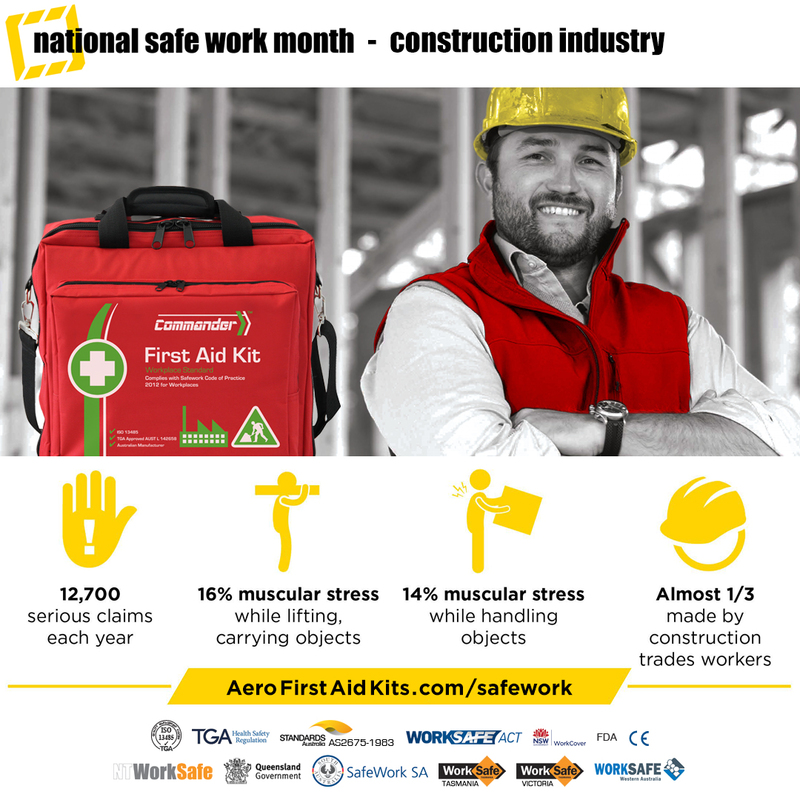 With unannounced visits to construction work sites by SafeWork NSW due to an increase in injuries and fatalities, the Construction Industry is a major focus nationwide for National Safe Work Month this October. Five years of statistics gathered by the Australian Government statutory body Safe Work Australia between 2011 and 2016 show that Australia’s Construction Industry has on average 12,700 serious workers compensation claims every year, with muscular stress a major problem – 16% of claims were due to lifting and carrying heavy objects and 14% while handling objects, causing muscular stress. On average 31 fatalities occur each year, 60% due to falls or falling objects. The Construction Industry operates in tough environments, often requiring First Aid Kits to be inside cases rated for all-weather conditions and resistant to dust and other airborne particles created during the construction process. Kits needs to be able to handle a wide range of injuries both major and minor. Perfect for industrial and worksite environments, with one kit servicing up to 100 workers. Designed for site offices, industrial and construction environments, with one kit servicing up to 50 people. Designed for work vehicles, offices, and smaller worksite environments, with one kit servicing up to 25 people. Categories: AU News, News. Tagged:first aid kit case options | first aid kit refills | outdoor worker first aid kits | workplace compliance Bookmark the permalink. October is National Safe Work Month, focusing on reducing injuries and fatalities in Australia’s work places throughout the year. 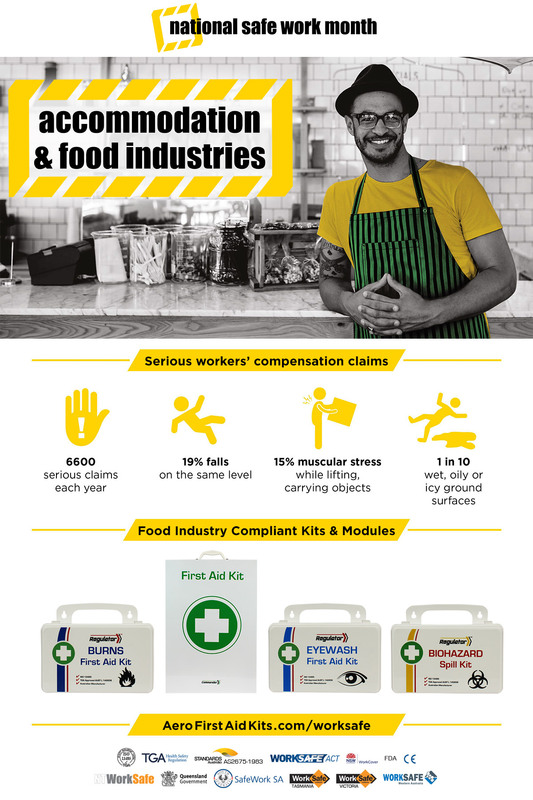 Statistics gathered by the Australian Government statutory body Safe Work Australia during 2011-2012 and 2015-2016 show that in the Accommodation & Food Service industries there were on average 6,600 serious workers compensation claims each year, 15% of which muscular injuries sustained from heavy lifting and 19% from same-level falls, often due to wet and oily spills. Accommodation and Food Services often have special requirements in any work situation that involves handling food from the farm to the plate: high visibility plasters and dressings are among the requirements to ensure that workplace injuries do not lead to foreign objects contaminating food, and burn treatments are needed in many food production and preparation areas. Perfect for industrial food preparation environments, with one kit servicing up to 100 workers. Designed for medium-sized industrial food preparation environments, larger grocery stores and restaurant kitchens, with one kit servicing up to 50 people. Designed for restaurants, cafes and smaller grocery store environments, with one kit servicing up to 25 people. These food-grade kits contain a wide range of high quality Aero Healthcare products that meet Australian Standard AS2675-1983. Containing our famous blue detectable adhesive plasters and other products to meet the stringent criteria required of the Australian and New Zealand Food and Beverage industries, these First Aid Kits are the ideal solution for any business where food handling takes place – allowing your workforce to quickly respond to any workplace emergency. Internal compartments and shelves keep product organised, and these tough metal cabinets are able to be wall mounted. Refilling the contents is simple with our Instant Restock™ system: you can refill and service kits quickly with a single order of refill pouches designed to fit into each cabinet. They provide quick access to all product through a unique centre slit pocket without the need of unpacking each individual product. All our cabinets are available with custom labelling. Categories: AU News, News. Tagged:burn injuries | food and beverage industry | workplace compliance Bookmark the permalink. Sadly the annual rate of fatal drownings has increased from 280 to 291 according to figures released by Royal Life Saving. Australians are urged to check their preparedness for Water Safety, especially as the weather warms up and people and families begin to spend more time boating, swimming and exploring Australia’s waterways. Fence Pools ensure swimming pools are well fenced in line with regulations, using self-closing and self-latching gates. Life Jackets on boats or simply near the water, such as when fishing, everyone should wear a life jacket. Some state schemes will allow you to replace old life jackets for new ones. Life Guards on the beach swim only between the flags where life guards are on duty, and at the pool ensure a life guard is present. At both the beach and the pool ensure your watch your children at all times, do not rely on the Life Guard alone. 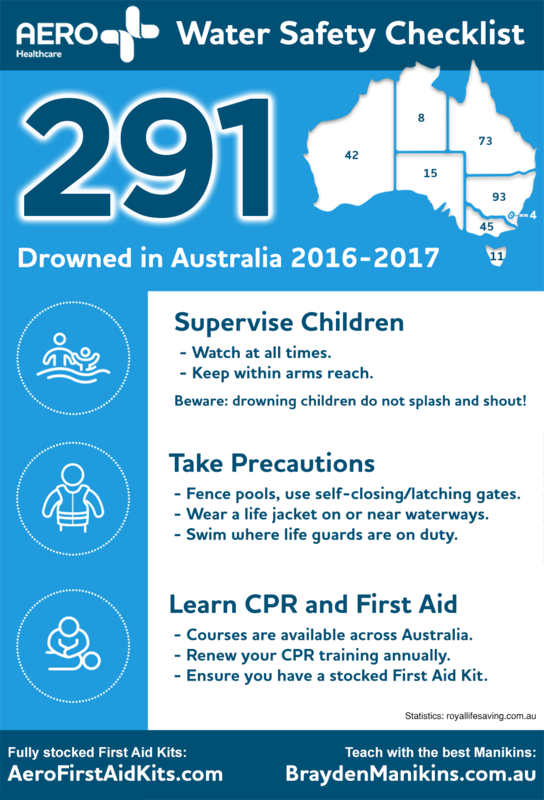 With 291 drownings reported during June 2016 to June 2017 – an increase of 11 on the previous 12 month period – Australia needs to spread the word. Download our Water Safety Checklist and spread the word on Pinterest, Facebook, Linkedin and Twitter. Aero Healthcare has a large selection of First Aid Kits for all your needs. Our Responder, Defender and Responder kits come stocked in Weather Resistant cases with supplies to assist with CPR – perfect for stowing on boats and around swimming pools. Categories: AU News, News. Tagged:camping first aid kits | home first aid | weatherproof first aid kits Bookmark the permalink. 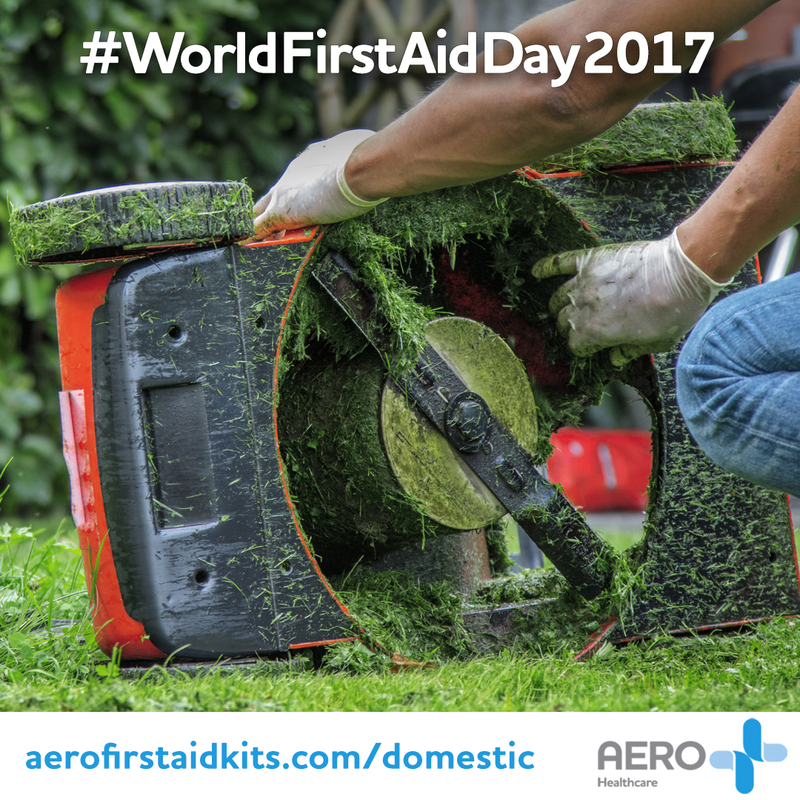 This “World First Aid Day” is highlighting domestic and workplace accidents – a hot topic in Australia with more accidents taking place at home than any other location. Almost half a million Australians are admitted to hospitals every year as a result of injury, with around 12,000 people dying from their injuries. 10 years of research into childhood injury in Australia between 2002 and 2012 showed that 24.5% of reported childhood injuries were in the home, with falls causing 38% of injuries with fractures and open wounds accounting for over 50% of injuries. Falls are also common in adult home injuries, with thousands of people admitted to hospital each year falling from ladders and buildings, with yet more injured by power tools, lawnmowers and non-powered tools. Research by the Australian Institute of Health and Welfare had the lawnmower emerged as the most dangerous DIY tool in 2013-14 and was responsible for amputating fingers in 57 cases and toes in 10 cases. Categories: AU News, News. Tagged:gift ideas | home first aid | nice first aid kits | tough first aid kits Bookmark the permalink. 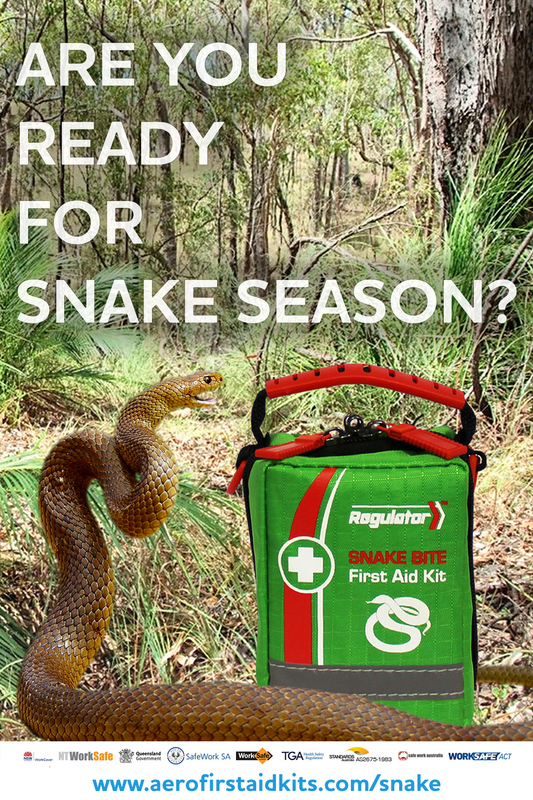 Before Snake Season starts again (although even in these colder months, snake bites are still being reported in the news across Australia) get prepared with the right First Aid supplies and a CPR course – yes, a CPR course! New research from 10 years of data from the Australian Snakebite Project published today in the Medical Journal of Australia shows that snake bite victims who collapse after venom enters their bloodstream are rarely receiving CPR from bystanders. While other first-aid measures (pressure bandages and immobilising both the limb and the patient) are commonly being correctly performed to prevent the venom travelling from the bite site, the bite victim is often given no more bystander First Aid assistance while waiting for an ambulance or other professional medical assistance to arrive. Unfortunately the study showed that the most common snake bites were from brown snakes, their bite when envenomed causing the victim to collapse and have a heart attack – causing 43% of snake bite deaths. If a snake bite victim collapses, CPR is vital to keep the blood circulating to the vital organs. In the study it has been shown to be life-saving, however inexpertly a bystander performed it. In the study, Australians who survived a snake bite after collapsing had received CPR within 1 minute of being bitten, compared with 15 minutes – often by arriving First Responders – for those who died. Be prepared with a Snake Bite Kit. Be prepared with CPR training (but perform CPR even if untrained). Seek immediate medical attention – get the victim to hospital by ambulance. Ensure your CPR course uses the best training Manikin – the Brayden LED CPR Manikin uses animated LED lights under the skin to show you the effect your CPR technique is having on getting blood flowing to vital organs. Ensure you have a Snake Bite First Aid Kit when you most need it – our ultra-portable Regulator Snake Bite First Aid Kit can be worn on the belt and contains everything you need to treat a snake bite, including instructions. For full details and to add to Your Quote, visit the Regulator Snake Bite product page. Categories: AU News, News. Tagged:belt loop first aid kits | camping first aid kits | softpack fabric first aid kits Bookmark the permalink. Farming is often overlooked by the general public when it comes to the perception of high-risk occupations, but according to Safe Work Australia between 15% to 12% of Australian worker fatalities occurred in the farming industry during 2009-2015 (source: safeworkaustralia.gov.au). These figures are all the more concerning when you realise 15% of fatalities are occurring in an industry that only makes up 2% of Australian workers (source: www.employment.gov.au). 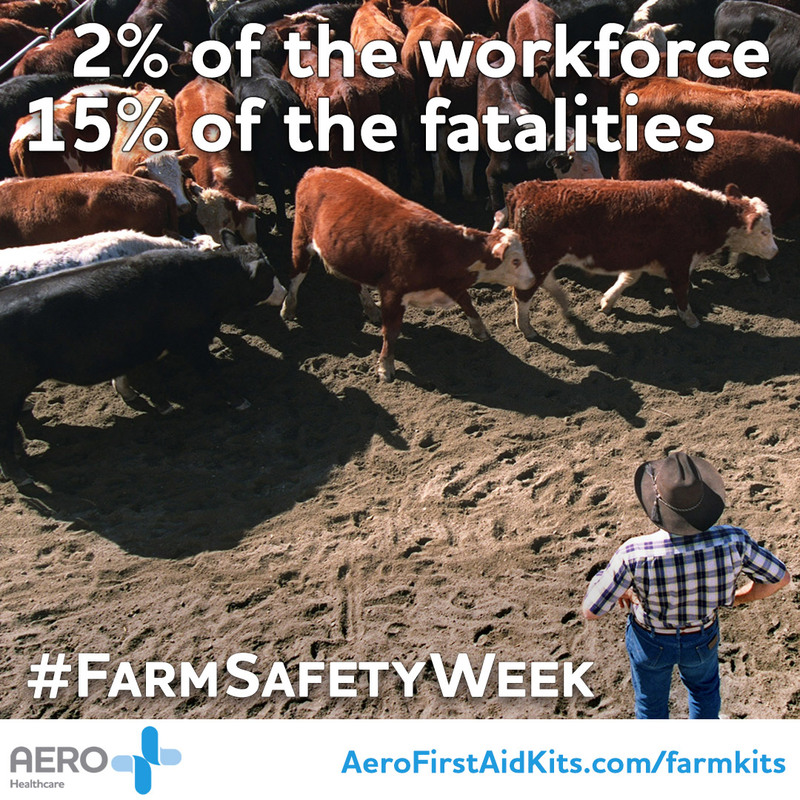 Which First Aid Kits meet state, territory and federal regulations for the farming industry? Aero Healthcare has a wide range of First Aid Kits in tough, durable cases with products for minor and major workplace injuries, wincluding visual-detectable products that meet Food Handling requirements and products to treat Snake Bites and stabilise workers injured in Remote Areas. Select from the First Aid Kits below to check your state and territory compliance and add to your quote. Perfect for industrial food handling environments, with one kit servicing up to 100 workers. Designed for medium-sized industrial food handling environments, with one kit servicing up to 50 people. Designed for industrial food handling environments with up to 25 people. Available in portable and wall-mounted case options, these worksite kits each service up to 50 workers in high-risk environments, and 100 workers in low-risk environments. 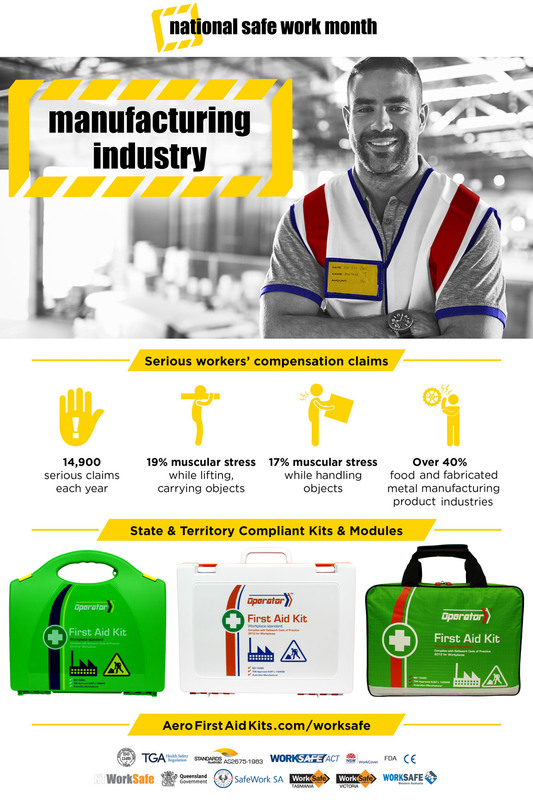 Compliance with workplace first aid regulations is achieved across all Australian states and territories with this broad kit range with a variety of outer cases to suit any scenario. Services up to 25 workers in high-risk environments, and 50 workers in low-risk environments. Respond promptly to incidents with case options to suit any vehicle. Services up to 10 people in high-risk environments, 25 people in low-risk environments. Containing rescue equipment in addition to a comprehensive First Aid Kit, this compact kit can service up to 10 people. Vital for farm workers, this 1-person kit can be worn on the belt. Categories: AU News, News. Tagged:food and beverage industry | outdoor worker first aid kits | tough first aid kits | workplace compliance Bookmark the permalink. International Water Safety Day is the perfect time to check your preparedness for Water Safety, whether you are boating, swimming or exploring Australia’s waterways. 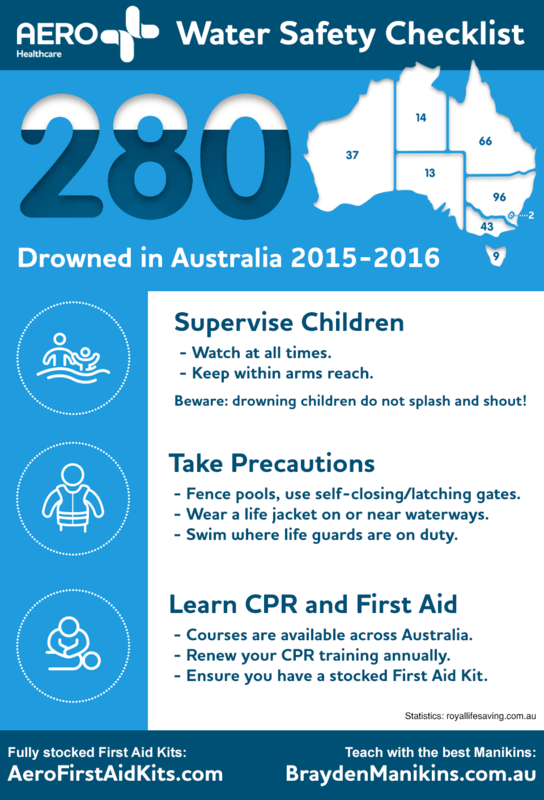 With 280 drownings reported during June 2015 to June 2016 and a huge spike over the 2016-2017 summer period, Australia needs to spread the word. Download our Water Safety Checklist and spread the word on Pinterest, Facebook, Linkedin and Twitter. Categories: AU News, News. Tagged:camping first aid kits | weatherproof first aid kits Bookmark the permalink. Small enough to fit into a pocket, bag or drawer yet full of useful items needed for minor cuts and injuries. 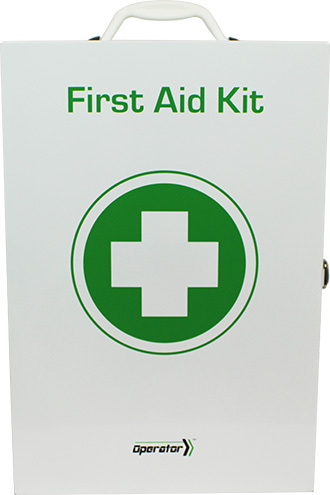 This personal first aid kit can be custom labelled, making it ideal to give away as a promotional corporate gift. Useful for traveling, commuting or keeping at work – your clients will always have your company brand in mind with this compact First Aid Kit always to hand. First Aid Kits make for a novel promotional item compared to the usual USB sticks and pens, and a First Aid Kit will give your company and brand a more personal, caring image. As Aero Healthcare is a market leader in the consumer woundcare market, you can be sure that the contents of this First Aid Kit are of the highest quality – unlike those found on many Corporate Gift websites. Contact our sales team today for wholesale custom-branded promotional First Aid Kits for your business! For full details and to add to Your Quote, visit the Companion 1 Series product page. Categories: AU Featured Products, AU News, Featured Products, News. Tagged:gift ideas | neat first aid kits Bookmark the permalink. We have a category listing all kits containing burn injury treatments, but did you know Aero Healthcare also have First Aid module kits specifically for the treatment of burns? The intention of these Burns Modules is to compliment your First Aid Kit choice to increase your capability in areas where the risk of burns is high or frequent. To cater for all workforces our specialty Burns Modules are available in a variety of sizes and contain high quality, proven products to relieve the burn and immediately begin the healing process. The rubber sealed plastic cases prevent dust contamination, and as with all our kits they can be custom labelled with your business or your clients business branding. These highly portable kits can also be wall mounted. 8 kits in up to to 5 case options. Services up to 10 people. Services up to 25 people. Services up to 50 people. Categories: AU News, News. Tagged:burn injuries | weatherproof first aid kits | workplace compliance Bookmark the permalink. 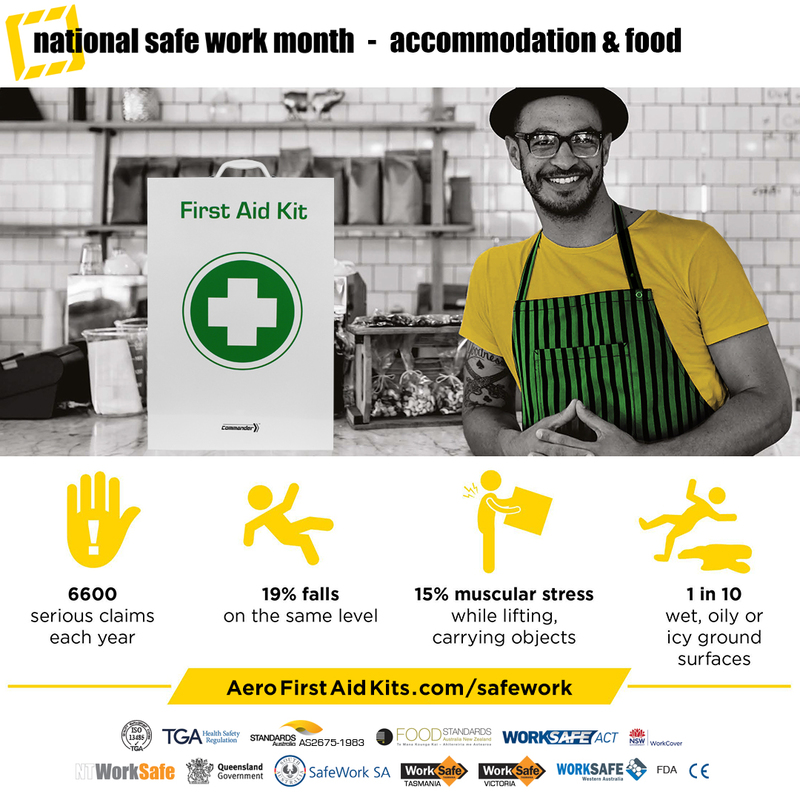 Australia and New Zealand have strict First Aid requirements for businesses that handle food, be they small foodservice businesses such as Cafes and Restaurants, Grocery stores of all sizes and large-scale food-processing industries such as abattoirs, frozen-food processors and factory kitchens turning ingredients into packaged foodstuffs from tinned foods to pre-prepared salads. Aero Healthcare has Food Standards Australia New Zealand approved First Aid Kits in a tough metal cabinets sized to suit your clients needs. The cabinets can be carried or wall mounted, and are key-lockable for security. All our cabinets are available with custom labelling to promote your business or your clients. 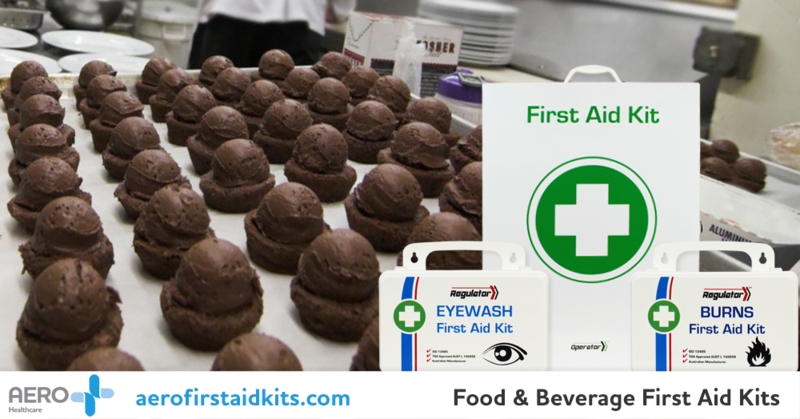 Containing our famous blue detectable adhesive plasters and other products to meet the stringent criteria required of the Australian and New Zealand Food and Beverage industries, these First Aid Kits are the ideal solution for any business where food handling takes place. All kit contents are refilled with our Instant Restock™ system: you can refill and service your clients kits quickly with a single order of refill pouches designed to fit into each cabinet. They provide quick access to all product through a unique centre slit pocket without the need of unpacking each individual product. Perfect for industrial food preperation environments, with one kit servicing up to 100 workers. Categories: AU News, News. Tagged:first aid cabinets | food and beverage industry | workplace compliance Bookmark the permalink. A new study has revealed that 1 in 4 Australians have no idea what to do if they suffer a snake bite, rising to 1 in 3 for Australians aged under 25. Of over 1000 people surveyed, 90% do not pack any form of First Aid Kit when they go bushwalking or visit the beach, leaving many Australians with no knowledge, no resources – or both – when they are most at risk of being bitten and furthest from assistance. “Too many Australians are relying on luck and chance to deal with a first aid emergency instead of having a plan and real-time access to potentially life-saving resources,” Assoc Prof White said. Find out how to treat a snake bite and have the exact resources to hand with our Regulator Snake Bite Kit, containing the first aid supplies you need and clear instructions on how to use them and what to do in this stressful situation. We are often asked “does my office need a first aid kit?” and the answer can be either complex or simple: simply, yes of COURSE your office needs a First Aid Kit because you care about the wellbeing of your employees! The longer, legal answer is that it very much depends on what Australian State or Territory you are in, how big your office is, how many people work in and visit your office, and what elements of risk are present. In short you need to consult the relevant authority that governs your location for advice not only on whether you are required to have a First Aid Kit but also how many kits are appropriate. However, to make things much easier Aero Healthcare have First Aid Kits that comply with all Australian states and territories, and we have selected kits from our full range that are particularly suited to an office environment, with case options that include our sleek professional Neat case that will look at home in any office or reception area. All our First Aid Kits can be custom-labelled with your organisations logo and colour branding. Compliance with workplace first aid regulations is achieved across all states and territories with this broad kit range. Workplace injuries in higher risk areas can be treated effectively with the quality selection of components in this kits. Respond promptly to incidents with a variety of outer cases to suit all types of environments. 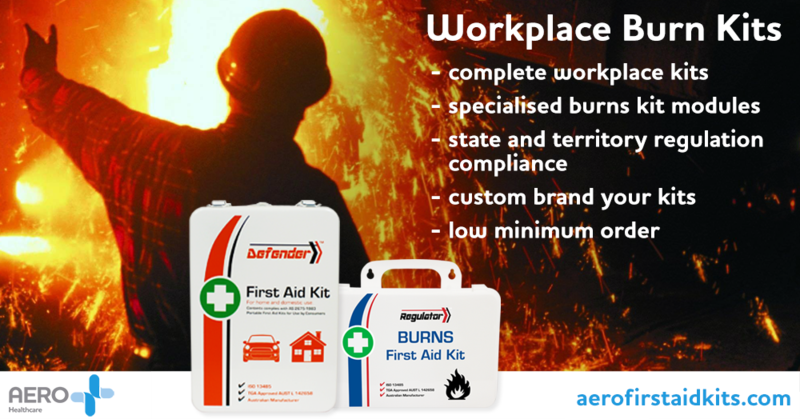 Ensure workplace compliance with this comprehensive kit to cater for any workplace emergency. For remote offices and premises on the edge of town, near bushland and on Industrial Estates there is always a risk of snakes – ensure your workers are prepared to deal effectively and quickly to a snake bite while First Responders are on their way. Respond to minor eye injuries promptly with this plastic case kit containing a range of products for eye wounds. The plastic case has a rubber seal to prevent dust contamination, and can be wall mounted. Provide effective treatment for burns injuries with burn gel pads and dressings. These plastic cases have a rubber seal to prevent dust contamination, and can be wall mounted. Essential for cleaning up bodily fluids in a hygienic and efficient manner, protecting the user from contamination. Categories: AU News, News. Tagged:metal first aid kits | neat first aid kits | rugged first aid kits | softpack fabric first aid kits | tough first aid kits | workplace compliance Bookmark the permalink. The ACT Government is re-issuing advice on how best to avoid snake bites following a sharp rise of injuries in the territory. Canberra and the ACT has an abundance of native wildlife including eight species of snakes – and they are an important part of the environment. If you do come across a snake, just calmly back away and give it a wide berth – do not confront it or attempt to move or harm it. When walking, wear enclosed shoes and avoid walking in long grass. Snakes need food, water and shelter to survive – keeping your yard tidy makes it a less attractive environment to snakes. If you see a snake in your yard, move pets and children away for an hour or so – it is most likely just passing through or looking for food, so just leave it alone. Give them their space and they will give you yours. If a snake bite occurs, the victim should avoid moving as much as possible – so having the right equipment to treat a snake bite to hand could save your life. 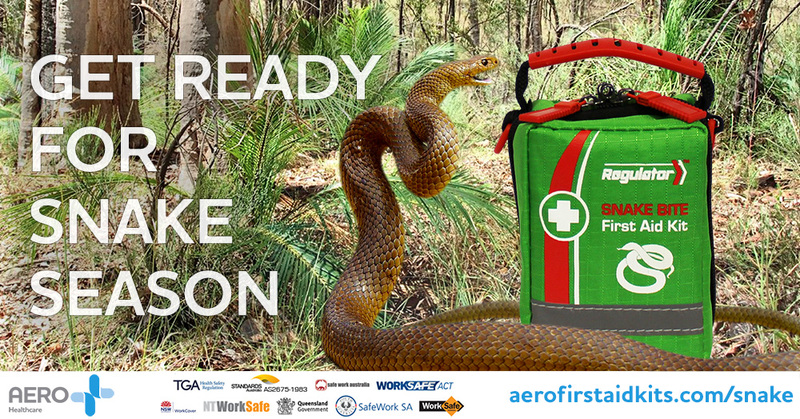 Aero Healthcare’s Regulator Snake Bite First Aid Kit is highly compact, and fitted with a belt loop to allow you to easily carry it when out near the bush. With exactly the bandages and dressings you need and clear instructions on how to use them, our Snake Bite First Aid Kit gives you the best chance of a positive outcome in this stressful situation. Don’t get caught out this summer – make sure you and your workers are protected with Aero Healthcare’s Regulator Snake Bite Kit. Categories: AU News, News. Tagged:belt loop first aid kits | camping first aid kits | outdoor worker first aid kits Bookmark the permalink. Do not move anyone who has been injured unless they are in immediate danger or need first aid. Do not remove helmets unless the person is vomiting or has stopped breathing (have one person support the head and neck, while another gently lifts the helmet off from the back). Call the police if anyone is killed or hurt, if the other driver fails to stop or swap details or is drunk or under the influence of drugs. Call the police if there is considerable damage to things other than cars. If nobody is injured and everyone involved has exchanged their details, arrange your own tow then report the crash later to the Police Assistance Line. Call your insurance company as soon as you can and make a claim. For more information see the full guide at Roads and Maritime Services. 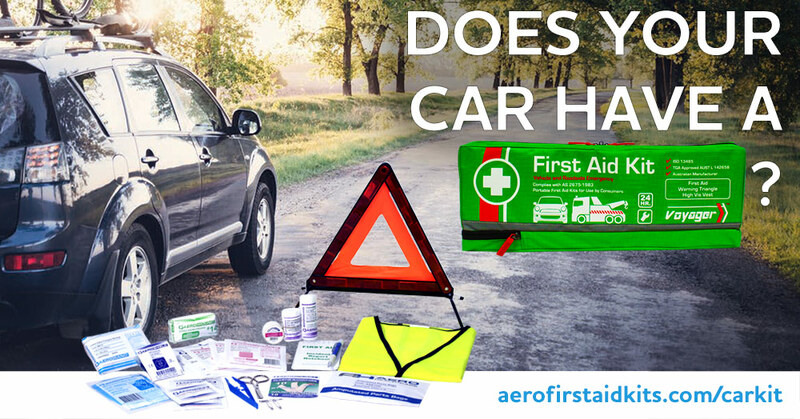 To assist in your roadside safety and injury treatment, Aero Healthcare have created the Voyager 2 Road Safety First Aid Kit – containing a warning triangle and safety vest to provide you and your vehicle visibility, making other drivers aware to make way and use caution while passing. The comprehensive first aid kit contains a full range of products to treat both minor and major injuries, with items to assist with CPR should it be necessary. Whether you have a traffic related injury or not, having the Voyager 2 Road Safety First Aid Kit in your vehicle ensures you will always know where to locate a First Aid Kit on the road or at your destination. For full details and to add to Your Quote, visit the Voyager 2 Road Safety product page. Categories: AU Featured Products, AU News, Featured Products, News. Tagged:first aid kit refills | softpack fabric first aid kits | vehicle first aid kits Bookmark the permalink. What first aid kits meet NSW workplace requirements? 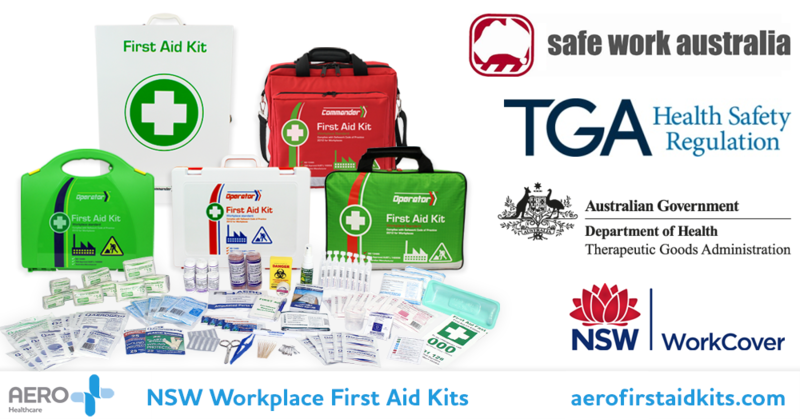 Our high quality first aid kits have contents that meet Australian Standard AS2675-1983 and comply with NSW WorkCover, Safe Work Australia and TGA Health and Safety regulations and requirements. Consult the NSW Government SafeWork Website for guidance and your legal obligations for what you must do about first aid in the workplace. Designed for offices, industrial and worksite environments, with one kit servicing up to 50 people. Designed for vehicles, offices, industrial and worksite environments, with one kit servicing up to 25 people. For full kit contents and full State and Territory compliance see individual product details. All kit contents are refilled with our Instant Restock™ system: you can refill and service your clients kits quickly with refill pouches designed to fit into each case type. They provide quick access to all product through a unique centre slit pocket without the need of unpacking each individual product. Categories: AU News, News. Tagged:first aid kit refills | workplace compliance Bookmark the permalink. Snake Bites are always a risk for anyone spending time in nature, whether camping and bush walking or working outdoors slashing long grass or working on roadside construction. Victims of snake bites should avoid moving as much as possible, so it is important to always have what you need in an emergency to hand – for this reason the Regulator Snake Bite First Aid Kit is fitted with a belt loop to keep close by at all times. This compact tough fabric kit contains all the bandages and dressings you will need to cope with a Snake Bite. The kit comes complete with a Snake Bite First Aid Leaflet explaining exactly what to do if you suspect a Snake Bite has occurred, Snake Bite Symptoms, a Snake Identification chart, DRSABCD and how to treat a snake bite with this First Aid Kit. Categories: AU Featured Products, AU News, Featured Products, News. Tagged:belt loop first aid kits | camping first aid kits | outdoor worker first aid kits | softpack fabric first aid kits Bookmark the permalink. 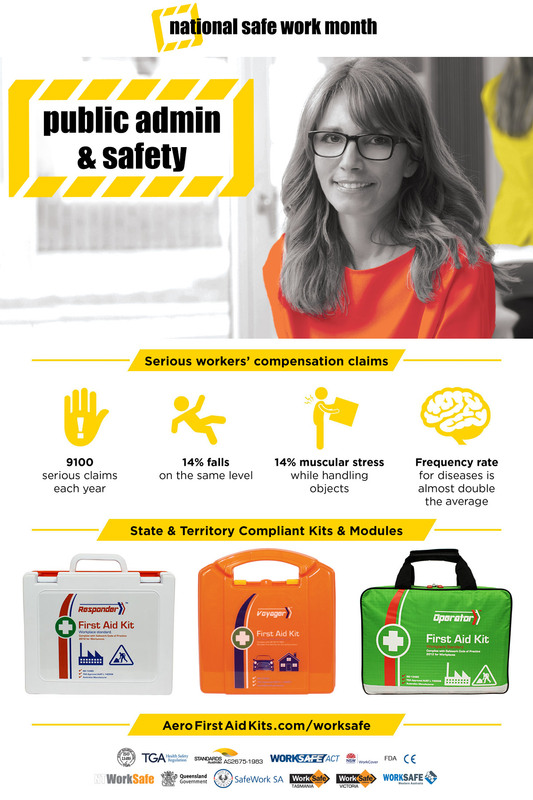 Ensure workplace compliance with the Operator 5 Series First Aid Kits across all Australian States and Territories. This comprehensive range of softpack grab-and-go bags, wall-mounted metal cabinets and Rugged, Weatherproof and Neat plastic cases contain a wide range of high quality Aero Healthcare products that meet Australian Standard AS2675-1983 and allow your clients to quickly respond to any workplace emergency. Refilling the contents is simple – instantly refill with a single order that comes bagged for quick turnaround refilling. To additionally meet compliance for the Food and Beverage Industry, see the OperatorFB 5 Series variant tough metal cabinet. For full details and to add to Your Quote, visit the Operator 5 Series product page. Categories: AU Featured Products, AU News, Featured Products, News. Tagged:first aid kit case options | workplace compliance Bookmark the permalink.